Your emergency brake cable needs to work in an emergency. Can you trust the foreign brake cable your auto repair shop installs? Where do you go to buy your auto parts? If you bring your vehicle in to an auto repair shops for service, you probably don’t know the answer to that question; you get your parts from the auto parts store where your auto repair shop gets their automotive parts. You trust them to buy quality parts for your vehicle. Hopefully, your trust is well placed. Unfortunately, and through no fault of their own, your auto repair shop may purchase aftermarket auto parts that are dangerously inferior. In particular, such is the case with parking brake cables. These are also known by the more ominous name of emergency brake cables. But, whether you rely on them when parking or in an emergency, you want them to work. 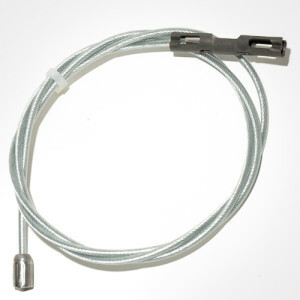 Most auto parts stores sell parking brake cables that are made in China or other foreign countries. They’re almost uniformly manufactured with inferior materials while paying lower wages for less experienced labor. While this offers a savings for the distributor of the parking brake cables that savings isn’t shared by the consumer. All they get for their money is a dangerously inferior emergency brake cable. There is only one U.S. manufacturer of aftermarket auto motive emergency brake cables. That company is Bruin Brake Cables in Fox Lake, IL. While selling their parking brake cables for essentially the same price as the dangerously inferior foreign brake cables, the Bruin Brake Cables are made with the highest air-craft quality cable. Fittings are also made with the best available materials and the labor is highly skilled and particular about quality. The comparison isn’t merely a question of competitive sniping. Rather, the folks at Bruin Brake Cables regularly test their cables, as well as random samples of their foreign competitor’s parking brake cables. The results are astounding. With the foreign parking brake cables, they fail a 1,200-foot-pound test approximately nine out of 10 times. But, the Bruin Brake Cables pass 99.9 percent of the time. The occasional Bruin parking brake cable that fails is rejected while the inferior foreign parking brake cables are sold and mounted on consumers’ cars. The situation has been reported to the National Highway Traffic Safety Administration but the wheels of government turn slowly. Fortunately, consumers don’t have to wait for the NHTSA to wake up to the danger; the consumers can purchase their parking brake cables from Bruin online. Or, consumers can insist that their auto repair shops purchase quality Bruin emergency brake cables. Cables are shipped by the next business day. While that means a short wait, consider that few auto parts stores stock a wide assortment of parking brake cables. In other words, you’re liable to wait for the inferior foreign parking brake cable to arrive anyhow. Even if you have to wait another day, if the parking brake cable is likely to fail, why bother putting it on the car at all? The only real option is to install an emergency brake cable that lives up to its responsibilities. And that includes stopping your car in an emergency.